Social Studies at the Lower School is an exploration of the cultures, ideas, and beliefs of our past and present world. As part of their inquiry into neighborhood, community, and government, children are encouraged to make connections between their experiences and the curriculum. The central goal of the curriculum is to present children with the skills and knowledge needed to be effective participants in their environment. We provide them with opportunities to learn about the American experience and the many cultures that make up the world. Thus, they discover and explore commonalities and differences among people and places. Forms of inquiry range from the experiential to research and often culminate in assemblies and festivals that demonstrate key aspects of their topics. Teachers of different disciplines work closely within the Lower School to provide an integrated experience of a content area. Topics of study are chosen and developed based on children’s stages of growth and the landscape of our changing world. 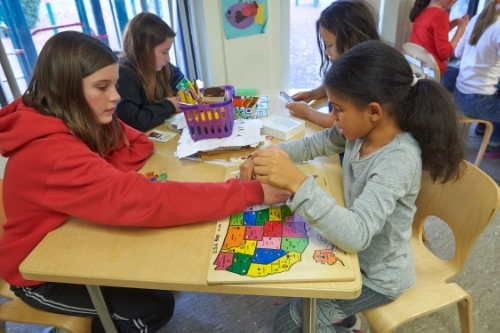 At each grade, topics are valued for their content but are also vehicles for skills that are introduced, practiced, met again, and developed throughout the Lower School Social Studies curriculum. These skills include asking questions, learning where to find information, making observations and generalizations, synthesizing, note-taking, writing (including research papers), participating in discussions, and performing oral reports and dramatizations. The Social Studies program in Beginners, Kindergarten, and Grade 1 is designed to help students develop a positive sense of themselves, recognize cultural differences, and understand the dignity and worth of all people. For these young children, units of study may focus on the social structure of their own classrooms, homes and families, holidays, some current events, and thematic units. All classes become familiar with basic geography. Through discovering and synthesizing information, children in Grades 2 through 4 come to know about cultures of long ago and the present, from Egypt and Africa to the immigrant enclaves of the Boston area. Children may take field trips, write puppet shows, take simulated trips to other countries, begin acquiring research skills, and undertake a variety of projects. A few examples of experiences children may have include trying on clothes, singing songs, and meeting visitors from other countries. In the Grade 5 and 6 curricula, language arts and social studies are closely integrated. Students read historical fiction, non-fiction, and primary source material while exploring a topic. Their courses build on writing skills gained in Grades 2 through 4 and emphasize note-taking and writing summaries, essays, and research papers. Both grades present plays, assemblies, or festivals as a culmination of their studies. Topics may include the exploration and settling of North America, the Native Americans of the Eastern Woodlands, and the United States Civil Rights Movement. Students in Grade 6 also study the geography of Near and East Asia; focusing on the social structure, literature, religions, and laws of two or more countries, students practice skills of comparison and contrast.